Hello and welcome to another installment of Sharing the Process! 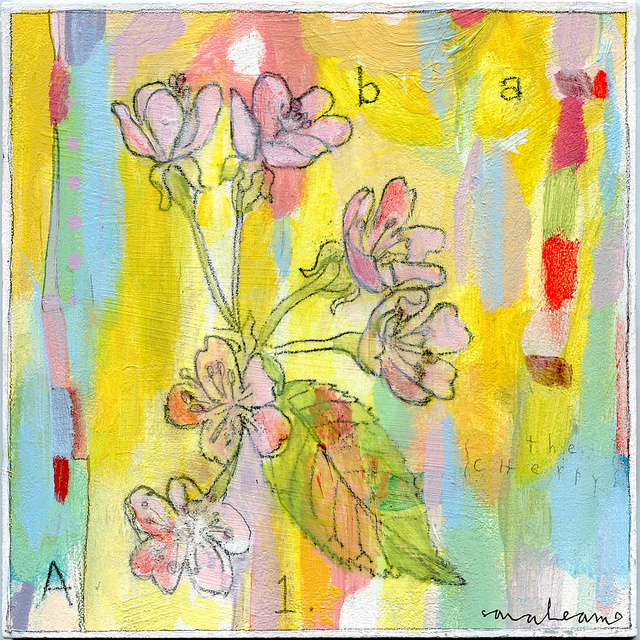 Today Sarah Ahearn Bellemare talks about her journey as an artist, from a child to the "many hats" she wears now as painter, author, and instructor. 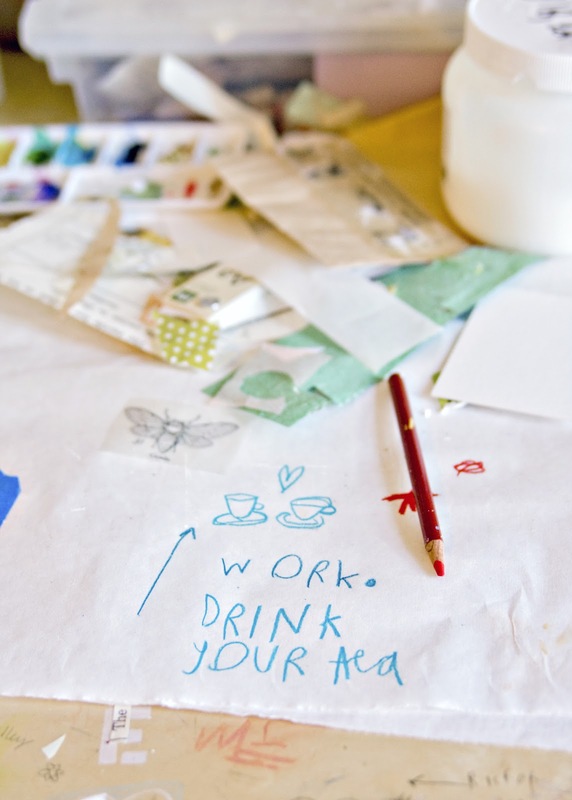 Sarah's bright and playful paintings combine paper ephemera, text, and paint beautifully. 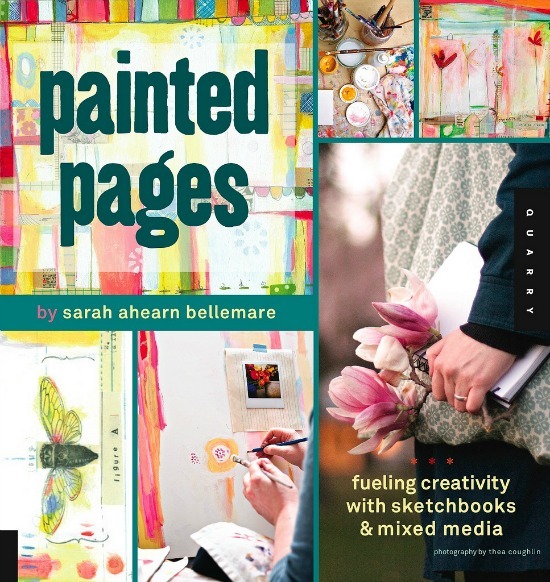 Find out what inspires Sarah in her work and check out her book Painted Pages: Fueling Creativity with Sketchbooks and Mixed Media and upcoming online course! Thank you Sarah! I don’t remember a time when I wasn’t making something as a little girl. Whether it was doodling with crayons and markers, or painting shells and rocks that I had collected on the beach, those were the types of creative activities that were always my favorite things to do as a child. Fast forward to college, when, in a drawing class, my teacher noticed I was holding my pencil like a paintbrush and suggested that try painting instead. As I look back now, I remember the pencil to paper process feeling very foreign to me compared to the comfort, ease and joy I felt once I began to paint. On following day I returned to class with a paintbrush and have never looked back. That teacher went on to be a mentor to me throughout my early career, encouraging me to follow my instincts as an artist even though I was painting in a very different way than my classmates. Those first paintings of mine were made on the backs of old kitchen cupboards and found pieces of wood rather than stretched canvas. While others in my classes were painting realistic landscapes in oil paint, I was working in acrylic and collage, making huge messes as I worked spread out on the floor. The inspiration behind many of those early paintings were words and poems- ee cummings, Rilke, Walt Whitman and even my own poetry, I was painting as a way to illustrate the words. The paintings that resulted were very abstract, filled with text of the poems painted or stamped throughout. The combination of visual and verbal, text and image, has always been part of my creative process; the two are intertwined, quite often the text coming first, leading me to the imagery as I begin to paint. Shortly after college, I began apprenticing with a painter whose work I admired. There were many long days painting in the studio, and it was during that time when I began to I learn how to “be an artist”. In addition to painting together, she taught me the business side of an artist’s life, and encouraged me to set up a show and try to sell my work. Right around that same time, I took an impromptu trip to Paris with my then boyfriend, now husband. It was 1999 and we went to ring in the new millennium under the Eiffel Tower. While under the spell of that magical city, I decided that upon my return I would focus myself wholeheartedly on becoming a full-fledged artist. I returned home, had my first solo show, and sold almost every piece. At that point, for me, there was no tuning back and I’ve been working hard at “being an artist” ever since. I’m happy to say that I’ve stayed true that plan I dreamed up in Paris, even though the path wasn’t a completely straight and narrow one, certainly with a lot of bump and bobbles, but it’s been the right one since it has lead me to where I am today! These days, being an artist means I wear many hats! In addition to painting, I teach in-person workshops a few times a year through Squam Art Workshops. This fall, through Squam, I will be teaching in the woods of New Hampshire, on the beaches of the Outer Banks of in North Carolina and to the Adriatic Coast of Italy! 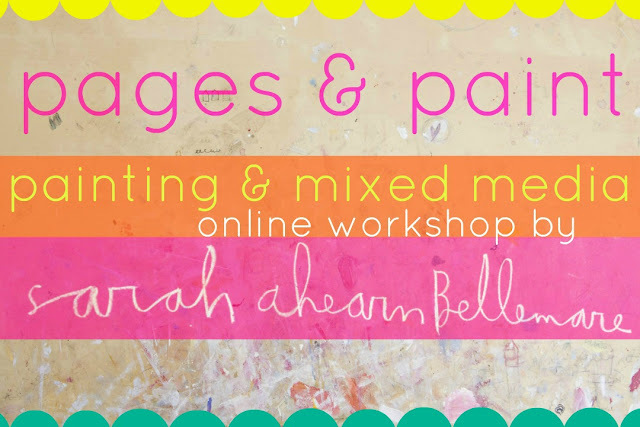 In addition, I’ve just launched my first online workshop, called pages and paint, and I couldn’t be more thrilled! To be able to reach students across the globe and share what I do to help others find their creative paths, is truly a dream come true! In addition to teaching, I find that I’m writing more and more these days about my work. 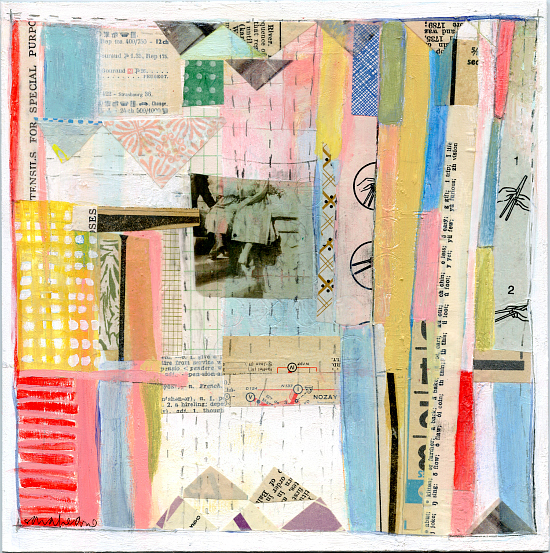 My biggest project yet was writing my book- Painted Pages: Fueling Creativity with Sketchbooks and Mixed Media which was published through Quarry Books in May of 2012. It was my first book, and a true labor of love, not to mention my daughter was born during the process, one day after my first big deadline in fact! Now that my book is a year old, and my daughter is two, I have some ideas for another book, so we’ll see if I can find the time to make it happen. I regularly exhibit my paintings throughout the Northeast in galleries and at art fairs as well as online as well as selling in my etsy shop. Whenever inspiration strikes, you’ll find me paint-covered and making art alongside my 2-year-old daughter in my sunny studio in Northampton, MA. When I’m not painting, writing, or teaching, I am dreaming up new adventures to take with my ecologist husband and our adorable little girl. I always start by recording my ideas, creative sparks and inspiration in my sketchbook. The pages of my sketchbooks are covered with anything that strikes my fancy- scraps of paper, ticket stubs, photos, and leaves to lines of poetry, notes and doodles, anything that might inform a future painting. 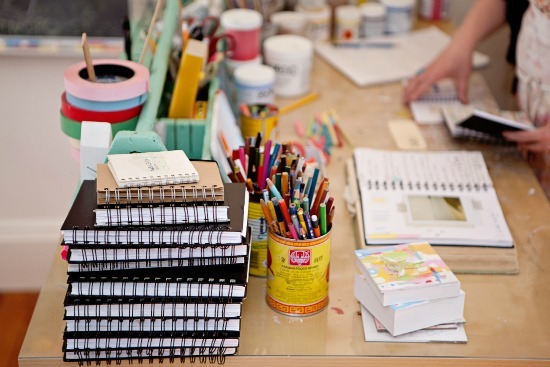 My sketchbooks are my most important “tool” when it comes to my creative process; I am constantly referring back to them for ideas as I work in the studio. As for where I find inspiration, it can happen almost everywhere! Sometimes I get my best ideas in the shower or on a walk in my neighborhood, I love looking through antique and junk shops, in old books, and at maps, vintage signage. Things like dress patterns, dictionaries, faded maps, old bird watching guides make me so excited, the list could go on and on. Finding the ephemera to use in my artwork is really part of my creative process. 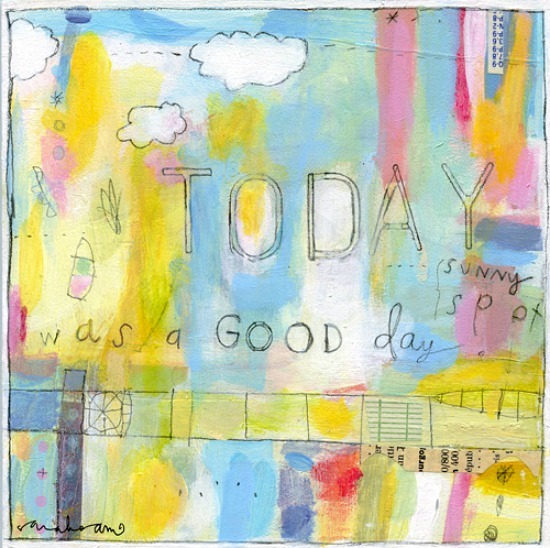 I love anything that becomes “one with the board and paint”, thin, old papers are my favorite to work with. Found black and white photographs are “adopted” from flea markets and antique shops in addition to my own family’s photographs. 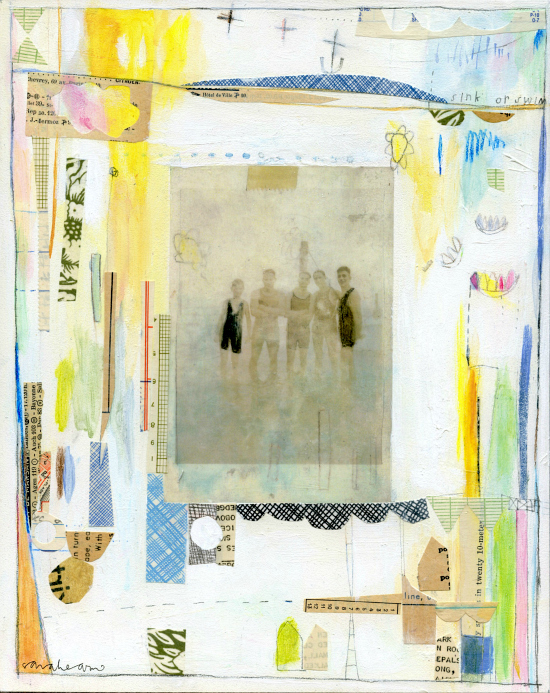 Both find their way into my paintings are and given new lives and stories when mixed with paint and collage. I find inspiration in the everyday- singing silly songs with my daughter and painting side-by-side with her, the colors of the farmers market, an escape to the beach, a walk in the woods, farm stand flowers, evening drives in the country, old fashioned ice cream shops, experimenting with my letterpress from the late 19th century, chatting with artist friends over endless cups of coffee and cupcakes, vintage children’s books, the quilts of Gee’s bend, old botanical prints, giant outdated maps and imagining living in Paris someday. Very much looking forward to your online workshop, Sarah!